Jaune Toujours speelde in een unieke 360° set-up voor het Big Bang Festival in Gent. Jaune Toujours zette de centrale inkomhal aan de bar op stelten. In een heuse disco opstelling konden de kinderen alles goed bekijken. En wie zich niet kon inhouden mocht gewoon zelf meeblazen op één van de vele extra instrumenten. Piet Maris & co kregen de bende gemakkelijk aan de “swich swich” en de polonaise. Jaune Toujours beleefde een schitterende tijd op de Big Bang Festivals in Gent, Antwerpen en Brussel! Het Nieuwsblad was er bij en schreef een mooi sfeerverslag. Lees het hier. Laatste kans om het zelf te ervaren op 24 en 25 november in Lille (Frankrijk). Bekijk zeker ook eens de foto's en video's gemaakt door de aanwezige fans. Muzikaal is het album vooral ‘stomend’ te noemen. Ska is vaak aanwezig, maar ook jazz, afro en nog zoveel andere genres. Een zeer fijne review van het nieuwe Jaune Toujours album EUROPEANA door Folkroddels.be! Lees de volledige review op de Folkroddels website. Hello friends in the UK! The new album Europeana by Jaune Toujours will be released in the UK on October 26. It comes in a photo book with pictures by drummer/photographer Théophane Raballand, making it a beautiful object of art and a nice gift as well. Another option is to buy the vinyl + digital download code. Hit your local record store (or buy it in our webshop or on Bandcamp)! Waow! Our song 'H'bibi' from Europeana is #3 of the Top 10 new music releases at Spin The Globe - world music radio - RADIO KAOS. The making of EUROPEANA vlog Episode 4! Episode 4 in "The making of EUROPEANA" vlog is out! Learn about the title 'Europeana' of the new album by Jaune Toujours, the inspiration for the lyrics and guest musicians from Ouagadougou, Aleppo and - wait for it - Leuven! 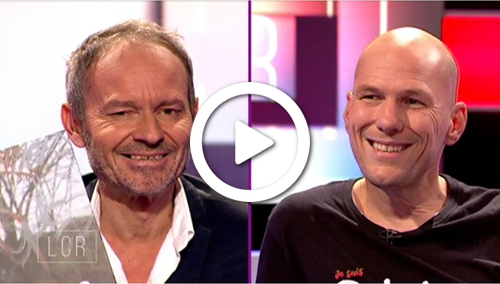 Mais il est génial cet interview avec Piet par David Courier sur BX1! Very happy with our young volunteer for YOUCA (Youth for Change and Action) at the Choux de Bruxelles - artist collective office. Very happy with our young volunteer for YOUCA (Youth for Change and Action) here at the Choux de Bruxelles - artist collective office. More than 15,000 Flemish and Brusselian young people are committed to working for a company, an organization, a government or a private individual today. The wages they earn, 50 EUR, go to a strong youth project of Plan International in Ecuador and a few projects in Belgium. We asked Lula to devise a marketing campaign for our new merchandising: T-Shirts and Tote Bags. You can see the result down below and in our webshop and the Jaune Toujours Bandcamp. Some loving words about the Jaune Toujours concert at Festival FrancoFaune by Sébastien Defrance from le suricate. Read the full review (in French) on their website, or by clicking the link on the right. Another lovely review by Keys & Chords Magazine! Don’t hesitate to love this Belgian band: explosive, engaged, funky and eclectic! Quality first! Another lovely EUROPEANA review, this time by Marino Serdons for the online music magazine Keys & Chords. Read the full review (in Dutch) on the Keys & Chords website or by clicking the link on the right side.